A couple of days ago there was an article on the New York Times titled, "How meditation may change your brain." The article cited some of the recent research studies that have found strong evidence on the benefits of meditation. The primary focus of the article was a study where people who never meditated before were taught meditation, and asked to practice the learnt meditation technique for 30 minutes a day for eight weeks; at the end of these eight weeks, researchers found substantial changes in their gray-matter of the brain that is associated with memory, empathy, and stress management. 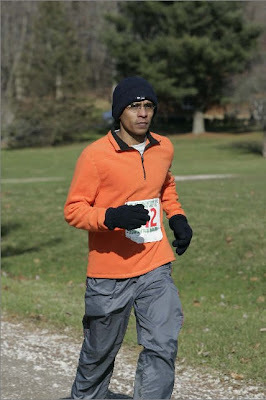 The first three pictures show my facial expression while running long distance races (as captured by professional photographers of the races) before I started practicing meditation. The last three pictures are from races after I started the habit of meditating during my runs. When I saw these after-pictures for the first time, I was myself surprised by the stark contrast in my facial expressions. Although I was in physical pain in both the Before and After races (because of running-related injuries), somehow meditation had helped me be in a state of peace after I started meditating during runs. Another major difference, which could not get captured in the pictures, was my attitude towards these races. Earlier, I used to be extremely competitive, and always wanted to finish my races with the best possible time, but once I started meditating during my runs, finishing didn't matter so much. What mattered most was enjoying every step of my run to the fullest extent possible. Of course, I am still a novice in meditation, so I was not completely successful in eradicating the goal of a "fast-finish" completely out of mind. However, I believe, the effect was significant enough to enable me to enjoy most of the marathon's distance without worrying too much about my performance. Paradoxically, the biggest surprise of embracing meditation during my runs was that my performance improved dramatically. Yes, my finish-times, actually improved several notches once I started meditating during my races. 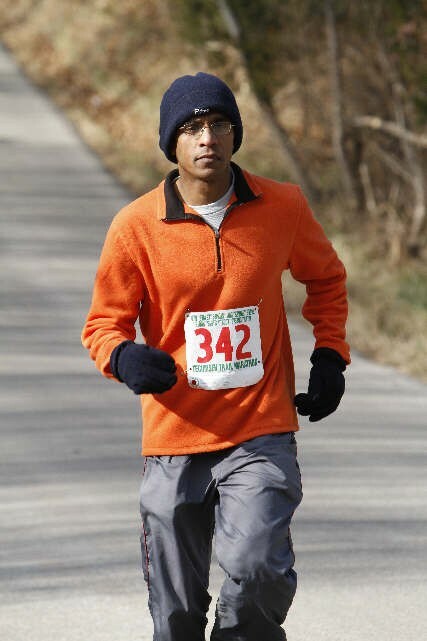 The maximum improvement was in a road-marathon, where I improved my previous best time by close to an hour. Although part of this improvement could be attributed to my greater experience in running long distance races, I believe it doesn't explain all the improvement, primarily because my amount of practice runs for these races weren't significantly higher than my previous races. So, I believe, the most important factor for improvement must have been my shift from a competitive/performance mindset to the mindset of just experiencing every moment of a run wholeheartedly. Probably, performance mindset consumes a lot of our mental energy, which leaves less available for use on the task at hand. Although my improved performance may seem to be the most dramatic result here, it was completely besides the point. I will definitely not recommend anyone to take up meditation with purpose of increasing performance, because the purpose of meditation is to free ourselves up from our obsession on performance. It is not to use meditation as a tool to further enhance our performance. If our performance does increase after meditation, I believe, we should consider it just a bonus. The primary benefit of meditation, as I see it, is being able to live in peace. I have a long way to go when it comes to living every moment of my life in peace. However, I am very happy that I have embarked on the journey. From this perspective, I am very grateful to the personal crisis in my life that started it all. Intellectually, I knew quite a lot about meditation and its benefits, but they were not enough to motivate me to start practicing meditation myself. Meditation, despite its researched benefits, seemed like a waste of time for an active person like me. It was not until I found myself muddled up on emotional crossroads that I undertook a spiritual journey that involved meditation. This makes me think, "Although we all hate suffering and try our best to avoid it, sometimes the best gift we can ever receive in life is suffering, because in it lie the seeds of human growth, development and enlightenment." Good point about the purpose of meditation. The goal is to be able to go into a complete meditative state and NOT meditate in desire of something. Dear Anonymous Reader, thanks for sharing the link about how pressure and stress adversely affects our performance. Appreciate the share. Being a researcher in the area of organizational behavior, I am familiar with the research studies quoted in the article. However, my increased performance in running still surprised me because running is not an "implicitly-learned motor skill" like tennis or playing the piano. "Choking" should not affect long distance running, because running is a very simple activity and doesn't involve the complex coordinations that's required in tennis or piano playing. You're so interesting! I do not believe I have read a single thing like that before. So nice to discover someone with a few original thoughts on this issue. Seriously.. many thanks for starting this up. This site is something that is needed on the web, someone with some originality! I do trust all of the ideas you've offered in your post. They are really convincing and can definitely work. Nonetheless, the posts are very short for novices. May you please prolong them a bit from next time? Thanks for the post. my weblog :: Freaky Monster - sind die allseits beliebten Talismane - liegen ab heute in.